Lasers are everywhere nowadays: doctors use them to correct eyesight, cashiers to scan your groceries, and quantum scientist to control qubits in the future quantum computer. For most applications, the current bulky, energy inefficient lasers are fine, but quantum scientist work at extremely low temperatures and on very small scales. For over 40 years, they have been searching for efficient and precise microwave lasers that will not disturb the very cold environment in which quantum technology works. A team of researchers led by Leo Kouwenhoven at TU Delft has demonstrated an on-chip microwave laser based on a fundamental property of superconductivity, the ac Josephson effect. They embedded a small section of an interrupted superconductor, a Josephson junction, in a carefully engineered on-chip cavity. Such a device opens the door to many applications in which microwave radiation with minimal dissipation is key, for example in controlling qubits in a scalable quantum computer. The scientists have published their work in Science on the 3rd of March. Lasers have the unique ability to emit perfectly synchronized, coherent light. This means that the linewidth (corresponding to the color) is very narrow. Typically lasers are made from a large number of emitters (atoms, molecules, or semiconducting carriers) inside a cavity. These conventional lasers are often inefficient, and dissipate a lot of heat while lasing. This makes them difficult to operate in cryogenic environments, such as what is required for operating a quantum computer. In 1911, the Dutch physicist Heike Kamerlingh Onnes discovered that some materials transition to a superconducting state at very low temperatures, allowing electrical current to flow without any loss of energy. One of the most important applications of superconductivity is the Josephson effect: if a very short barrier interrupts a piece of superconductor, the electrical carriers tunnel through this non-superconducting material by the laws of quantum mechanics. Moreover, they do so at a very characteristic frequency, which can be varied by an externally applied DC voltage. The Josephson junction is therefore a perfect voltage to light (frequency) converter. The scientists at QuTech coupled such a single Josephson junction to a high-quality factor superconducting micro-cavity, no bigger than an ant. The Josephson junction acts like a single atom, while the cavity can be seen as two mirrors for microwave light. When a small DC voltage is applied to this Josephson junction, it emits microwave photons that are on resonance with the cavity frequency. 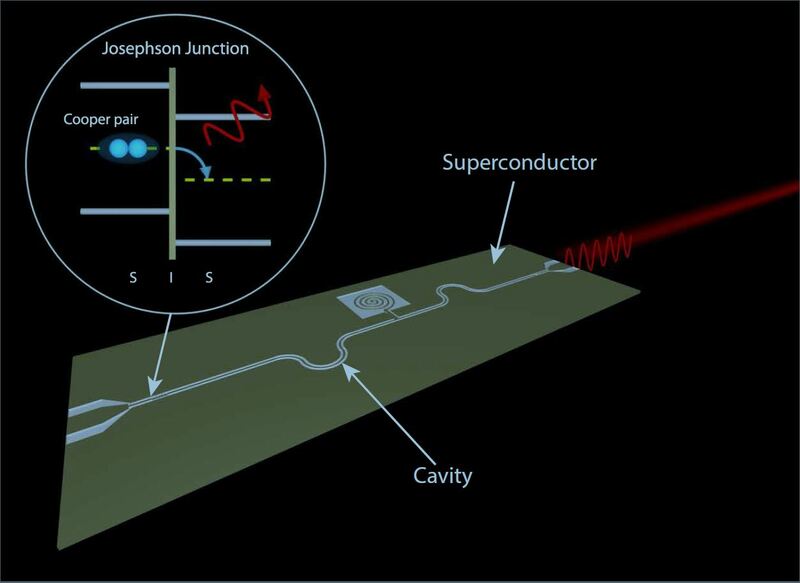 The photons bounce back and forth between two superconducting mirrors, and force the Josephson junction to emit more photons synchronized with the photons in the cavity. By cooling the device down to ultra-low temperatures (< 1 Kelvin) and applying a small DC voltage to the Josephson junction, the researchers observe a coherent beam of microwave photons emitted at the output of the cavity. Because the on-chip laser is made entirely from superconductors, it is very energy efficient and more stable than previously demonstrated semiconductor-based lasers. It uses less than a picoWatt of power to run, more than 100 billion times less than a light globe. Efficient sources of high quality coherent microwave light are essential in all current designs of the future quantum computer. Microwave bursts are used to read out and transfer information, correct errors and access and control the individual quantum components. While current microwave sources are expensive and inefficient, the Josephson junction laser created at QuTech is energy efficient and offers an on-chip solution that is easy to control and modify. The group is extending their design to use tunable Josephson junctions made from nanowires to allow for microwave burst for fast control of multiple quantum components. In the future, such a device may be able to generate so-called “amplitude-squeezed” light with has smaller intensity fluctuations compared to conventional lasers, this is essential in most quantum communication protocols. This work marks an important step towards the control of large quantum systems for quantum computing. Demonstration of an AC Josephson junction laser. M.C. Cassidy, A. Bruno, S. Rubbert, M. Irfan, J. Kammhuber, R.N. Schouten, A.R. Akhmerov, L. P. Kouwenhoven. Researchers at QuTech have built an on-chip microwave laser based on a fundamental aspect of superconductivity, the AC Josephson effect. The device is made from a single nanoscale Josephson junction strongly coupled to a superconducting cavity. When a small DC voltage is applied across the junction by a battery, the difference in energy causes microwaves to be released when a Cooper pair tunnels across the junction. The cavity then provides amplification, resulting in a beam of coherent microwave light to be emitted from the cavity. The device may have applications in building a scalable quantum computer.